Most of us, most of the time, don’t really grasp the fact that we are continually constructing the meaning of life. A naïve perspective assumes that meaning is something ‘out there’ in reality to be searched out, discovered, and assimilated into our view of things. So, even though constructivism has been in our cultural consciousness now for well over a hundred years, the overwhelming majority of us don’t accept it as a valid statement concerning the nature of meaning and our mind’s role in making life meaningful. In our day particularly, rationality has gone out of fashion. Our social agreements and personal beliefs are based on other sources and foundations, not so much on whether our explanations and reasons are very reasonable. It’s of critical importance, then, that we take some time to dig into this question of truth and how we construct the meaning of life. 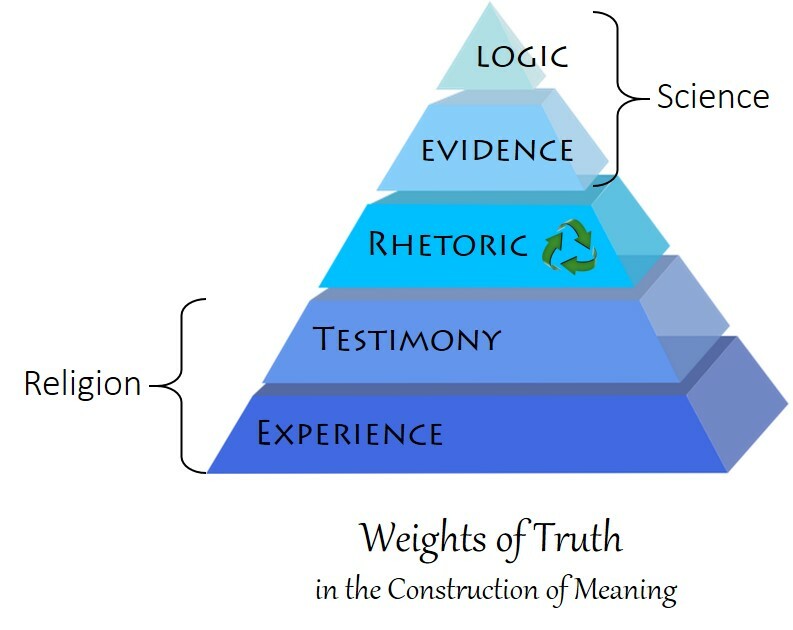 As a tool I have designed what I call “weights of truth,” organized as a pyramid of sources and foundations, with each level building on ones underneath it and in turn serving as a basis for those higher up. By “weight” I mean that we tend to rely more (deeper levels) or less (higher levels) on the various sources and foundations; that is to say, we give them more or less weight in our construction of meaning. Let me start by defining each weight (or level), and then we can come back to look at how this relates to a couple enterprises of culture that frequently contradict each other – at least in our time. Science and religion don’t have to compete for our loyalty, and for the longest time they actually complemented each other in constructions of meaning known as the distinct worldviews of human culture. After we have clarified the various weights of truth, I’ll make a case for how science and religion might once again cooperate towards a larger and more relevant meaning of life. When the individual senses, perceives, or undergoes something we say that he or she has an experience of it. As we all know, these senses and perceptions are not always (or even all that frequently) reliable representations of reality. There is a subjective quality to experience that makes it finally impossible to verify whether two individuals in the same situation are really undergoing the same thing. Experience is notoriously mercurial and inescapably biased. And yet we rely on it all the time to determine what is true and meaningfully relevant in what’s going on. Included in this category are the profound and essentially ineffable assumptions we carry from our prenatal, newborn, and early childhood period. Way back then our brain was calibrating our body’s internal state according to its sense impressions of the environment. Mother’s womb, the family circle, and our material surroundings conspired to form in us a nervous state that would maximize our chance to survive and grow. A warm, nurturing, enriched, and supportive environment strengthened a sense of reality as provident, benign, and friendly. In contrast, a toxic, hostile, and abusive environment signaled our nervous system to assume a state of anxiety, hypervigilance, and chronic distress. I give the greatest weight to experience precisely because everything else in our construction of meaning is built upon this baseline nervous state formed in our early days and years of life. As already suggested, its ineffability – the fact that we can’t fully find the words to articulate how we’re feeling at this level – is due to its formation prior to our acquisition of language. Consequently, experience is where the articulate mind sinks into the literally unspeakable urgencies of the body. To us, this is very simply (and indisputably) the ways things are. As we look out on reality, our nervous system is filtering out and focusing in on whatever confirms a visceral sense of what truly matters. By testimony I mean the words and witness of other people. It is positioned deep among the weights of truth because our worldview, as a construction of meaning, borrows heavily on the authority of those we depend on and admire. For reasons that don’t need to be explained, our baseline nervous state in early life seeks and finds confirmation in what our taller powers tell us about the nature of reality. Taller powers who abuse or neglect us are more likely to hold beliefs that represent life as “nasty, brutish, and short,” just as provident taller powers tend to speak of reality in more positive and optimistic terms. In this way, their nervous state literally spoke to our nervous state and we joined the trance. In essence, testimony is less about the factual accuracy of what is said than the trustworthy character of a witness. That’s why testimonies in the courtroom are validated or impeached on the basis of how honest and truthful a witness is made out to be. Particularly in religion, the unimpeachable authority of witnesses who attest to revelations whereby a higher truth was made known to them is a powerful shaping influence on the worldview of believers. They – or more accurately, their words as preserved in scripture and tradition – either confirm what believers already sense or hope is true, or else the authority of their witness might persuade nonbelievers to convert. The power of language in shaping thought, evoking feeling, and confirming or persuading belief is what we call rhetoric. The ancient tradition of Greek rationalism elicited suspicion in the philosophical establishment towards those (called Sophists) who used language to stir the emotions and entrance an audience, rather than challenging students to think in clear and distinct ideas. Rhetoric goes very naturally together with testimony, since it’s not typically the rationality of what someone says that pulls us over to their side, so much as how they say it. Thus charisma, speech-craft, pitch, volume and the cadence of words spoken (along with posture, gestures, and body language) are most often what persuades us, more so than the coherence, soundness, or realism of what is said. Indeed, if we have to determine the truth-value of someone’s testimony, we will check it against how trustworthy the person is before we bother checking the facts. It may well be that our susceptibility to rhetorical entrancement goes back to the sing-song voice of our mother that so effectively calmed us down and put us to sleep. Evidence is how reality presents itself to our senses. We detect something ‘out there’ and focus our perception in order to establish its objective status. Evidence is not how something feels to us or what it seems to be like, but what it is as determined through our observations of it. Despite this virtue of objectivity, however, we still find it necessary at times to distinguish between strong evidence, which is based in the way things really are, and false evidence that can lead us to believe something that isn’t really a fact at all. For example, before Copernicus the cosmology of most people took the observation of the sun arcing across the daytime sky as evidence of Earth’s stationary position at the center of everything. They really were seeing the sun moving, although what they saw wasn’t really the sun moving. It was false evidence, and it took Copernicus, Galileo, Kepler, Brahe, and a few other astronomers to finally convince most of us that in reality it’s the earth that moves around the sun. Western science has been a wildly successful enterprise in exposing false evidence and verifying strong evidence. My last weight of truth in the construction of meaning is logic, another element of language but more about the connection and coherence among the thoughts that words represent than the craft and persuasive power of speech. We can regard science as a research discipline (or system of disciplines) that is constantly working towards the most rational explanation of empirical observations gained through specialized instruments and meticulous observation in the field or laboratory. The terms rational and empirical acknowledge the two principal traditions of philosophy (rationalism and empiricism) that have shaped our Western mind and worldview. In other words, science isn’t and cannot be only about evidence – just the facts, as we say. It too, like religion and culture in general, is involved in the process of constructing meaning. Digging up fossils, splitting atoms, and organizing data must eventually flow into an exercise of theory-building, which is itself a special kind of storytelling but without the spell of rhetoric. No doubt, the success of science has everything to do with its commitment to doubting experience, setting aside testimony (e.g., “We believe it because Copernicus said so!”), completely replacing rhetorical flourishes with mathematical terminology, and bringing only the strongest evidence into theoretical patterns and predictions that can withstand rigorous controlled experiments. At the beginning of this post I alluded to that complicated relationship between an enterprise (science) dedicated to keeping our constructions of meaning as logical and evidence-based as possible, and one (religion) that is much more interested in reality as the provident, creative, and benign mystery in which we have our existence. For millenniums these two enterprises – one looking out and around to the turning unity of all things, and the other looking within and beneath ego to the grounding mystery of being itself – collaborated in the construction of worldviews that guided the lifeways of both indigenous tribes and great civilizations around our planet. Instead of a Great Chain of Being as proposed by esoteric philosophies, I am suggesting that what really held these constructions of meaning together and made them work was something closer to my weights of truth and the continuum of meaning they comprise. But when the theoretical framework of reality as articulated by science started to shift toward stronger evidence and more rational explanations, the sacred stories of religion couldn’t adapt as quickly. They continued to assume a three-story universe in the background of their sacred narratives, while science was revealing a very different cosmic order. In the attempt to save its myths, religion insisted on their basis in fact (evidence), drawing on the words of infallible witnesses (testimony) who had walked with gods, encountered angels, and touched the savior with their very hands. Today many devotees and true believers are trying desperately to keep science in service to religion, arguing for creationism, supernatural agencies, historical miracles, and a world beyond this one. But it won’t work – it can’t work, for the straightforward reason that its claims are rapidly losing currency, credibility, and relevance in contemporary life. It could be argued that our dogmatic insistence on the truth of obsolete and collapsing constructions of meaning is what is driving religion to fanaticism these days, at the same time as many disillusioned former believers are quietly slipping out of the sanctuary. By positioning religion deeper in the pyramid of weights I am making a case for interpreting its mythology as poetic art, representing in metaphor an experience of the present mystery of reality, and preserving its testimony through the tradition of generations. Rather than journalistic accounts of supernatural beings and miraculous deeds from a golden age of salvation history, its sacred stories serve to orient human existence – right now – in the great web of life and the adventure that each of us must take on, of waking to our higher nature and giving back in gratitude.